[UPDATE Dec 17: Election Results] A big win for the OBA sees Michael Dunkley [OBA] oust Patrice Minors [PLP] in C#10 Smith’s North. The OBA pick up a seat and get their Deputy Leader into the House. 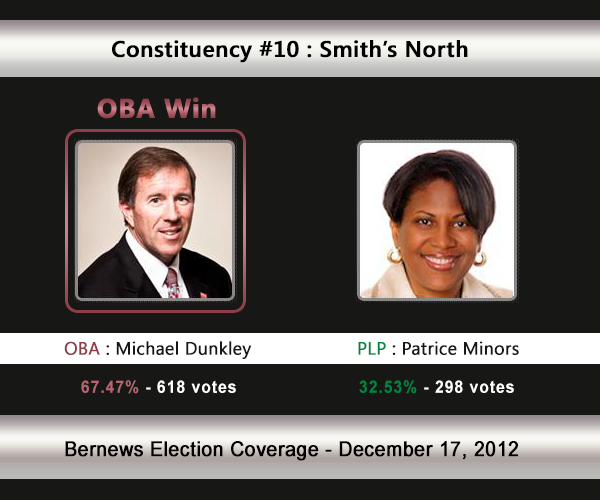 Smith’s North will be one of the more closely watched constituencies, with OBA Deputy Leader Michael Dunkley trying to oust the PLP’s Patrice Minors, who serves as Minister of Economy, Trade and Industry. In 2007 Mrs Minors defeated Michael Dunkley, winning 54.53% of the vote [536-444]. In the 2003 General Election, Mrs Minors won with 57.33% of the vote against Alan Marshall [UBP] who received 42.67%. 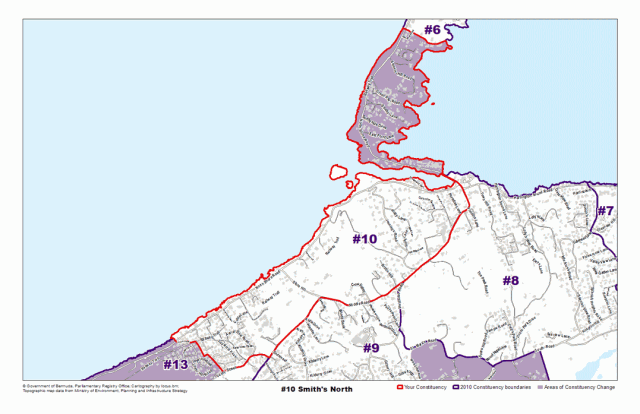 The areas the Smith’s North constituency compromises of, or is located by, includes Barkers Hill, North Shore Road, Flatts Bridge, Middle Road, Vesey Street and more. Patrice Minors has a wealth of knowledge and experience gained from her years spent in the International Business sector. Until most recently she held a position of Assistant Vice President of Trust Services at Butterfield Bank. Her commitment is to work towards enabling Bermudians to achieve their aspirations as well as contribute to the optimal development of the important business community. She was educated in Bermuda at The Berkeley Institute and earned her undergraduate and graduate degrees in Business Administration at Howard University in Washington, DC. Mrs. Minors was one of the first Progressive Labour Party (PLP) Government Senators. She became a Member of Parliament in the 2003 General Election, representing Smith’s North, and was appointed Minister of Health and Family Services, a portfolio for which she was responsible until October 2006. In November 2010 she was appointed Minister of Business Development and Tourism, a position which she held until November 2011 when she was appointed to the Ministry of Economy, Trade and Industry. This appointment also includes the responsibility for Community and Development. A member of the Society of Trust and Estate Practitioners, she has served on several boards, including the Bermuda College Board of Trustees, the Bermuda Small Business Development Corporation Board and the Immigration Board, where she served as Chairperson. She is also a past President of Big Brothers and Big Sisters of Bermuda and was voted “Big Sister of the Year” in 1998. A member of the First Church of God, North Shore, she is married and mother of one daughter. Michael Dunkley went to George Washington University and the University of Richmond in the United States, where he earned a Bachelor of Arts degree and a Scholar Athlete Award. Since he came back to Bermuda, Michael has run the family business that supplies Bermuda with milk – Dunkley’s Dairy. He has also been involved in public service for most of his working life. An active sportsman, Michael is immediate past president of The Mid-Ocean Club and a member of the Bermuda Athletic Association, the Bermuda Squash Racquets Association and Coral Beach Club. In his spare time, he’s a golfer and keep fit enthusiast. In his younger days, he played first-division cricket and soccer. He has held several shadow ministerial portfolios in his Parliamentary career as both an MP and a Senator. He and his wife, Pamela, are the proud parents of two children.